If you are after an ultimate solution when looking for transportable buildings in Western Australia. We have a large range of portable buildings that will suit all your needs whether you are after temporary or permanent buildings we have a solution to suit your requirement. We have portable buildings for sale or hire we provide, modular homes/buildings and dongas and we also have transportable weekenders/granny flats, we can also organise delivery to your location. Need a quote for Used Transportable Buildings For Sale in the Perth region or WA ? Get quotes from Ascention Assets Transportable Building Hire Solutions, free quote.. Need a quote for Secondhand Portable Buildings For Sale Perth Region? Need a quote for Transportable Accommodation in the Perth region? Need a quote for Used Site Offices For Sale Perth Region ? Second hand portable office for sale. 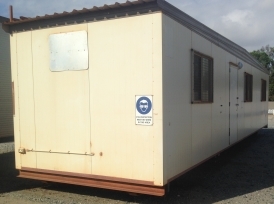 12x3m Portable office, comes with office furniture and A/C.